All of the mainstream press is wondering . . . where will CASEY ANYTHONY live. She was released from prison a couple of nights ago - and up until THIS MORNING - no one knows where she is. But MediaTakeOut.com EXCLUSIVELY does. According to one of out ROCK SOLID SNITCHES, Casey is now in COLUMBUS, OHIO. And this is not rumor - this is 100% FACT!! She left Florida as soon as she was released from prison. Casey boarded a private airplane at 1:04 A.M. and arrived at Columbus Ohio at 2:51 A.M. MediaTakeOut.com's snitch tells us that her attorneys put her on a Lear Jet because she could not take a commercial flight due to death threats. Casey is now staying just OUTSIDE of Columbus - in a PREDOMINANTLY African American suburb. We plan on releasing Casey's FULL ADDRESS tomorrow!! Oh, and we have the FLIGHT NUMBER and everything below. And yes . . . it CHECKS OUT!! 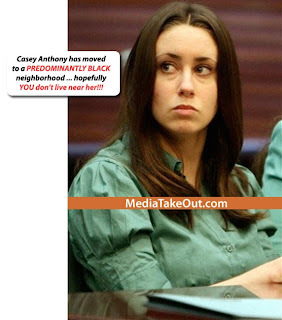 Members of the press are REQUIRED to credit MediaTakeOut.com for this EXCLUSIVE REPORT. We work VERY HARD to break these reports, and we DESERVE credit for doing so.